Back from the dead… or as close as any one of us probably would like to venture… is somebody who at one point seemed as though he was destined to be rock’s first true star, an artist who as much as anybody defined the optimism and excitement of rock ‘n’ roll music in its earliest days before anyone knew where this was all headed. Jimmy Liggins soon fell off that sizzling early track record when his songs tended to recycle much of the feel, the vocal mannerisms and (far more than is advisable) even the melodies and so by mid-1948 he had been passed by a number of more versatile acts, drifting back to the middle of the pack as rock’s roster got ever deeper. But that’s not exactly what we meant by saying he was back from the dead with this release. Jimmy Liggins wasn’t back from the creative dead, or even a commercial death spiral… after all his records had all been pretty decent even if they were growing repetitive and for the most part were modestly successful since his breakout back in early ’48, so his career, aesthetically or commercially, wasn’t even on its sick bed when we last saw him. No, what we mean is Jimmy Liggins himself was nearly killed back in April 1949, shot in the face at a show he was playing which broke his jaw, nearly severed his tongue and left his career, if not his life, hanging in the balance. Somehow that’s seems a little more to come back from than just rebounding from a flop. We detailed the gruesome particulars of the shooting itself in Liggins’ last single, Lookin’ For My Baby, released just weeks before the incident at a nightclub but not the cause OF the fight. Since a large part of the objective here is to try and paint a better picture of the environment this music thrived in, we might as well delve into the blow by blow account as it were. Besides, knowing the interest such events stir up in people it’s certainly not something we’d want to deprive you of hearing about, so here’s the scoop. It should go without saying that fights in clubs were common then, just as they are now. Anytime you have people drinking and dancing there’s bound to be some tussle over a woman or somebody’s new shoes get stepped on, a drink gets accidentally spilled, a look gets misinterpreted… I don’t think I need to run down the entire list of infractions that lead to this kind of thing. Suffice it to say if you’ve been out on the town in your life then you know full well the triggers that set these things off. 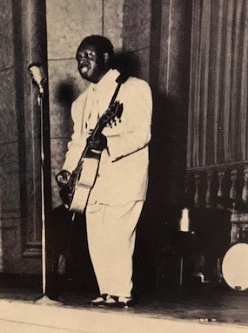 On this particular night Liggins and the band were playing a skating rink in Jackson, Mississippi and there was a crowd of about 700 people who paid to see him. There was dancing but there was also tables and chairs off to the side on the floor. The band had played for an hour and the horns, which of course in rock ‘n’ roll at this time carried a huge amount of the musical load, even more so in live venues where their sound carried well no matter how poor the sound system was, got a few minutes respite from playing as Liggins was taking an extended song – a version of After Hours – with minimal accompaniment from just the pianist, drummer and bassist. So Charlie “Little Jazz” Ferguson, the tenor sax player, stepped off the stage and went over to see his wife who had joined them there. Now this seems somewhat unusual for the time and the place. I’m all for the idea of the family that plays together stays together and far be it for me to say that the Fergusons didn’t have every right to travel with one another on these long extended tours, but the life of a musician on the road was hardly the most idyllic lifestyle, hit records or not. This was especially true of rock ‘n’ roll in the early days when the artists were all black and so many of the venues were down South and I shouldn’t have to tell you that no state was ever MORE racist than Mississippi. Though race had nothing to do with the events that unfolded it was still an unsettling itinerary for an extended family trip. In other words this was one time when Charlie should’ve said to his wife to stay home, wherever home was. Who knows though, maybe she was uneasy about these trips after listening to Liggins’ earlier song, Homecoming Blues, where Jimmy details his experiences – presumably fictitious, but every song has real life inspiration SOMEWHERE – regarding his indiscretions on tour, so it’s entirely possible Mrs. Ferguson wasn’t too keen on letting her husband disappear for three months at a time where young eager women were potentially throwing themselves at the band after these shows. But whatever the case may be she was joining them on the road and no doubt putting a damper on their extra curricular activities. But it wasn’t just the musicians at these shows who were being propositioned by female audience members, it was also any good looking girl in that audience too being hit on by eager and often cocky young men at these shows, which is where the trouble begins in this tale. When Charlie Ferguson left the bandstand to see his wife he found another man at her table with his arm around her, trying to coax her into some X-rated action later on most likely. Not surprisingly Charlie didn’t take kindly to this gentleman’s gracious offer and an argument started. Liggins leaped off the bandstand to play peacemaker – but also with the idea of trying not to upset his fan base who, bad manners aside, were crucial to keep happy so they’d continue buying his records. No he didn’t tell Ferguson to let his wife have some fun while he was working, but he might as well have, as instead he merely told Charlie to move his wife to a less visible spot to take away the temptation for these drunk and disorderly men. Ferguson wasn’t happy with that advice, after all his wife was (presumably) innocent in all this, it’s not as if she’d done something to encourage this crude boor to hit on her so why should she have to move? So she didn’t move but they still had to play and the next song required Ferguson’s sax, so he returned to the bandstand, eyeing the situation from afar and growing increasingly peeved at the entire situation. Who can blame him? As soon as that number concluded he was off the stage and back in this guy’s face – apparently this lout didn’t think the earlier confrontation provided him with any reason to stop his pursuit of somebody else’s wife! – and the guy pulled out a razor when Ferguson came towards him, slashing his strap to his sax and in the process slashing Little Jazz’s neck for good measure. Ferguson bent down to get his horn which was now laying on the ground, perhaps wanting to use it as a weapon if he was smart, and the guy proceeded to slice through Charlie’s jacket and cut his back to pieces for good measure. For the second time in the evening Liggins put down his guitar – a big mistake if you ask me, those things make effective weapons themselves – and raced to intervene… still trying not to alienate the perpetrator of this fracas, choosing instead to merely beg the guy not to kill his tenor sax player. The owner of the skating rink heard the commotion as well as someone saying that a guy in black was attacking the band – who other than Liggins were all dressed in beige – and charged in like the cavalry with a .22 rifle. Jimmy Liggins, the star performer, wasn’t dressed to match the others… he was dressed in black. It was a good wardrobe choice since that’s also the color worn for funerals and in this case it very nearly was his own funeral, as the club owner, mistaking him for the assailant, shot him in the mouth, breaking two teeth along with his jaw and ripping through his tongue. Liggins bled profusely and was told by the doctor that had he been shot an inch higher or lower the blast would’ve killed him. Not surprisingly – and not without some justification it should be added considering the fact that Jimmy didn’t quite have his boy’s back in this showdown – his band quit as he lay in the hospital and found other jobs. Even if they had been somewhat sympathetic to his plight it was no guarantee he’d be able to continue his singing career with a mouth that had an extra hole in it – and according to most accounts, though not Liggins’s own, with a reattached tongue that had nearly been severed in the shooting. By the fall of 1949 Liggins was back in Los Angeles just starting to get back on his feet, and maybe because it looked as if he would be able to resume his career at some point in the future Specialty Records president Art Rupe finally released another record on his star, reaching back in the vault for Nite Life Boogie, a song recorded almost two full years earlier. Somewhat shocking then that in spite of its vintage – and unlike Liggins after his ordeal – it’s really no worse for the wear. So… back to the music. Let’s start by reminding people that Jimmy Liggins had been in a unique situation from the start of his career in that he hadn’t any musical training, unlike his brother Joe, one of the most popular pre-rock bandleaders whom Jimmy had initially worked for as a driver. When Jimmy got tired of driving and decided liked the view from the stage better he announced he was switching professions. This revelation caught his brother off-guard, who said bluntly, “But you don’t know anything about music!”. Apparently Jimmy Liggins was a fast learner because once he signed with Specialty he cut a string of sessions in the fall of 1947 right before the recording ban hit which is what they drew most of his next two years of releases from (Specialty apparently was one of the few independent labels who actually adhered to the ban, as he didn’t come back in until late 1948 when it was nearly over). The amazing thing is how much of that work is really good. His debut, I Can’t Stop It, was terrific and its follow-up, Cadillac Boogie, was even better… one of the best rock records we’ve heard to date in fact. But it’s clear that for all of his good instincts he bothered hadn’t learned the intricacies of melodic variation because a lot of his ideas were cut from the same cloth and whether audiences got tired of hearing the same sound with only minor changes or perhaps it was simply that Specialty chose the best stuff first which had the most appeal, the later releases, while still decent material and consistently popular, failed to live up to his sizzling start or advance his career beyond that initial promise. Nite Life Boogie however is actually one of his better turns, as it doesn’t quite follow the exact same structure as so many of the others and contains some of his better, or at least more potent, lyrics. The horns – including of course the pre-cut-up Charlie “Little Jazz” Ferguson, joined by Harold Land on tenor along with alto and trumpet – kick this off in splendid fashion, a rolling groove that probably could use a baritone to weigh it down some but otherwise does everything its called upon to do, giving it a surging feel that Liggins will ride throughout the song. It’s a song that most resembles his first, I Can’t Stop It, which I suppose if you have to model it on something that isn’t a bad one to copy. But it’s not an outright rip-off either, there’s plenty of similarities for sure, starting with the fact that Liggins’s vocals feature a chanting delivery with a call and response with the others in the band. But he manages to use his half of the vocals to get across some pretty insightful lines about the nature of music and its role in the community, never resorting to just simplistic platitudes but actually seeming to want to convey to the uninitiated just what they’re missing if for some reason they’re not indulging in this communal experience. The band is hitting on all cylinders too and while this was recorded a little less than four months after I Can’t Stop It (and they were already a finely tuned ensemble even then let it be said), they’ve seemed to polish things up just a bit in the ensuing months, presumably spent on the road. It’s a streamlined sound, the intro especially is already deep in the groove, churning with a purpose that carries you along with it and makes Liggins’ eventual entrance seem like an extension of the music rather than split from it. Part of this too is that back and forth technique they feature wherein Jimmy and the other band members taking the responsorial vocals, not to mention the band as they play their instruments, all feed off one another with precision. Like pistons firing in an engine block their synchronization is impressive but probably taken for granted by those listening. Yet when Glen Wilson’s trumpet starts to play a counterpoint to it which isn’t altogether effective it might make you better appreciate what they were doing just moments earlier when it all fell together seamlessly. Luckily Wilson is elbowed out of the way by either Ferguson or Land, though he goes off again on his own later, though more in the background as the other horns take the lead. Those are minor quibbles however as the real thrust of this track is provided by Eugene Watson’s piano which lays down a simple but unrelenting rhythm that keeps everybody else locked in. The sax solos, whoever is handling them, are robust and efficient which is a pleasant surprise for those of us who seeing the recording date might’ve expected them to wander as so many rock sides from the period this was cut had a tendency to do. That’s what is so amazing about this, the fact there’s nothing about Nite Life Boogie that betrays the age of the recording. Two years, especially THESE two years which saw so many changes as rock ‘n’ roll got its footing, is a long time for something to sit and so when Liggins career took an unintended sabbatical and Specialty had no choice but to go back to the vaults you’d think that whatever they came up with would be well behind the times. But not this… not at all. Though certainly not cutting edge it manages to fit in perfectly with everything else going on in the fall of 1949. That it also happens to be Liggins best record since January 1948 sort of bolsters the argument that he never progressed much as an artist. But rather than take that as a criticism, maybe it shows that he was just remarkably consistent. Of course, the real story in all of this is what the release signified – that Jimmy Liggins was indeed returning to action. Though it’d be another seven months before he was back in the studio again at least now they were assured he’d be up to try and revive his career. All things considered, as stopgap records go Nite Life Boogie might just be the best such effort one could ever hope for. 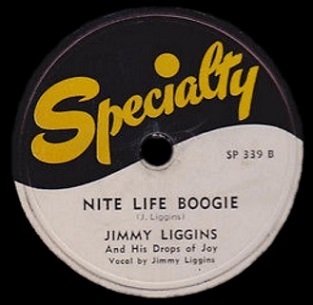 Leave a reply on "Jimmy Liggins: “Nite Life Boogie”"